Mill-Max is excited to introduce the addition of 2mm pitch spring-loaded connectors to our extensive line of spring-loaded products. As always, real estate is at a premium in electronic packaging with designers demanding tighter pitch interconnects that deliver high quality performance. These spring-loaded connectors (SLC’s) are an appealing option combining both durability and space saving qualities. 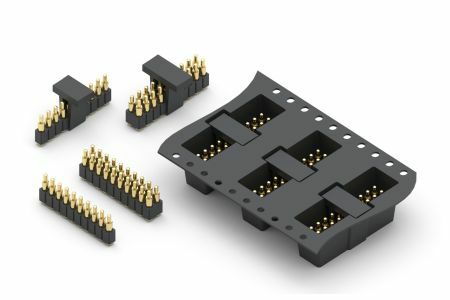 For board-to-board or device-to-board connections, these 2mm spring-loaded connectors are a practical solution. The connectors feature spring pins with a working travel of .0275” (0,7mm) and a maximum travel of .055” (1,4mm). With a base diameter on the pins of .056” (1,42mm) and a plunger diameter of .032” (,81mm) there is adequate space for laying out the PCB pads and traces on both the solder and mating sides of the connectors. The initial, uncompressed, height of the connectors is .295” (7,5mm). These new SLC’s are offered in single row, series 836-22-0XX-30-001101 and double row, series 838-22-0XX-30-001101. Standard availability is 2 to 10 positions for single row and 4 to 20 positions for the double row. Both series are available in tubes or on tape and reel which have pick & place vacuum clips to facilitate automated assembly.